The Y34 generation Infiniti M45 was only available for two years in the US, 2003-2004 and was sold in very limited numbers. It is however a unique looking car and even today will draw attention from folks who say "what is that? "(Joe everyman), "get outta my way road hog" (BMW drivers) or "hey, an M45, cool!" (DT readers). 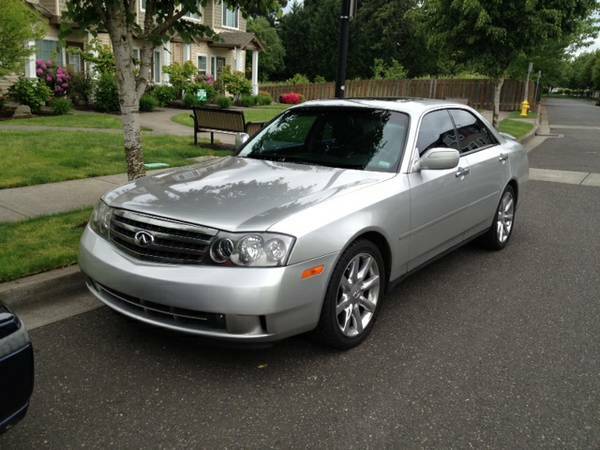 Find this 2003 Infiniti M45 for sale in Portland, OR for $6,990 via craigslist. Tip from Ryan T.
Anyone in the market for a slushbox equipped 540i, Mercedes-Benz E500 or Lexus LS should really take a hard look at the M45 as they offer excellent performance in a form factor that is far cooler. Parts may be tricky to get and fuggheddaboudit if you ever crack one of those headlights...but..it sure beats driving something ordinary.